We had a ladies’ book study at our apartment last Friday and I volunteered to host it. We scheduled it in a way that the study would be done at noon time and thereafter we could have lunch fellowship. I mentioned in the previous post that for the main course I made some hearty Italian Sausage and Tortellini Soup. For dessert, I knew I had to make something with pumpkin and since I never made a pumpkin cheesecake before I attempted to make one. It would have been fine and good if I just stopped at making the regular pumpkin cheesecake but I wanted something truly over the top and what else could make anything so sublime but CHOCOLATE!!! I have made a few white chocolate cheesecakes before so I already have some idea on how to add white chocolate to the mix so it was just a matter of balancing the flavors so neither the pumpkin or chocolate outdo each other. I wanted to achieve a perfect harmony of flavors between the two. Also, I wanted to do a No Bake version just to simplify it all but without sacrificing quality and taste. Since I know it would be quite rich, I thought of making it individually not only to add some personal touch to each dessert but also perfect for portion control (though I must warn you it is so more-ish, you’ll probably want 2!). I made this the night before and hoped for the best. I was praying that they would love it as I didn’t make any other dessert! Thankfully, it was given a very glowing review and I was truly surprised at how much it was well-loved. Hubby, who is no pumpkin fan at all, also totally enjoyed it and made sure I kept 1 or 2 extra glasses for him in the fridge for later!!! Everyone agreed that it was great to have the cheesecakes in cute little individual glasses as they presented nicely and they were also perfect for those who want to enjoy dessert but do it in moderation! 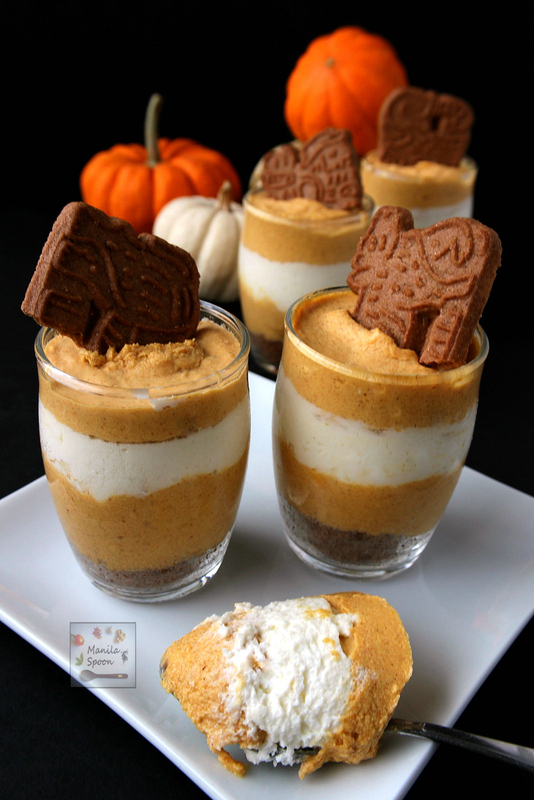 Enjoy these party-perfect pumpkin white chocolate cheesecakes! This is seriously a delicious fall or winter treat! With a spiced cookie crust and a layered pumpkin and white chocolate cheesecake that tastes out of this world – it is a winning dessert for the holidays and beyond! Combine the crushed cookies, sugar and melted butter in a bowl until moistened and well-blended. Divide the mixture evenly among the glasses. Press the crumbs to the bottom of the glass. In the bowl of a stand mixer, beat the softened cream cheese until fluffy and smooth (no more lumps). Adjust the speed to low then add the pumpkin puree, sugar, pumpkin spice and vanilla extract. Beat until everything is smooth and well-blended. While this is going on, melt the chocolate. In a heat-proof bowl over barely simmering water, melt the chocolate and butter. Stir often. Let it cool for a couple of minutes afterwards. To the pumpkin mixture add the cooled chocolate. Beat together until well-blended and creamy. If you haven’t whipped the cream and sugar yet do it at this point. I am using freshly whipped cream and sugar to ensure that the cream holds up and doesn’t flop. To assemble, spoon enough pumpkin cheesecake onto the cookie crust. 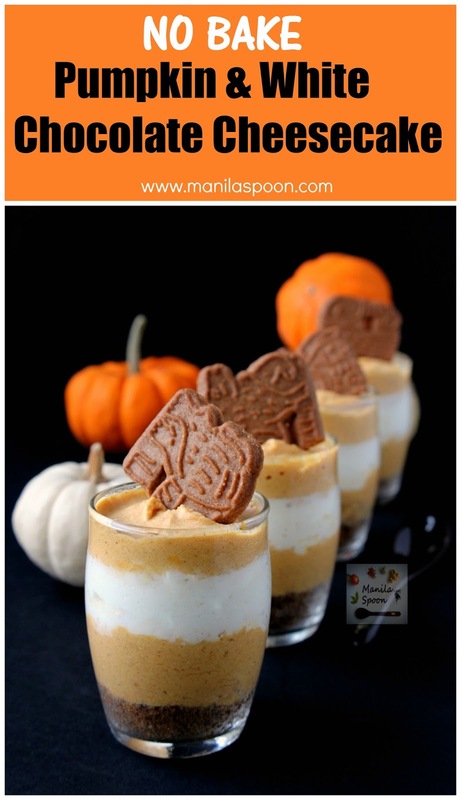 Layer with some freshly whipped cream and then top with another spoon or two of the pumpkin cheesecake. Refrigerate for at least an hour or two to firm up more. May be made a day ahead. Serve on top with a little broken spiced cookie as garnish. Enjoy! LOVE the idea of these–delicious! And am so glad you went with white chocolate! I confess I am not a huge fan of milk or dark chocolate with pumpkin. I agree with you Laura! Though milk and dark chocolate may do well with pumpkin the white one is the perfect one to pair it with. Thanks! These are so beautiful. I just love the layers on them. I am so happy to see all the pumpkin recipes around at the moment. I can never get enough of pumpkin recipes, too! Thanks Dannii! Such a cute idea! Perfect for all those upcoming parties! That is so true Rebecca as these can be made ahead of time. Thanks! These are so cute and I love that they are no bake. What a great idea for a Ladies lunch. These are absolutely gorgeous!! Love the cookie garnish. What a perfect fall treat. YUM! Thanks, the spiced cookies really were perfect with these! This is just in time for fall! Perfect halloween treat! I love how easy these are! I could see these at a Halloween party and being a huge hit! These are so cute! What a fun party dessert! I was just thinking how amazing pumpkin and white chocolate would be together! These look stunning and way too addictive! They are quite more-ish Alisa, I must say.Thanks for dropping by! 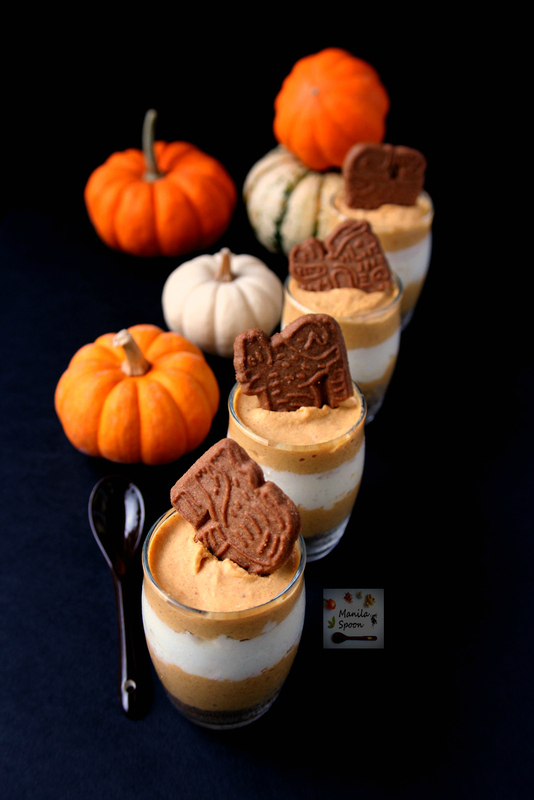 These little pumpkin cheesecakes are so cute and sound delicious, perfect for a fall party! Pumpkin and cheesecake are two of my husband's favorite flavors! He would love these! Abby, I love this. I particularly love it is no bake. No Bake is always the best! Thanks, Michelle! Love these little individual cheesecakes, Abby. White chocolate and pumpkin: a delicious match made in heaven!!!! Oh my these sound like little treats from heaven. And I love that they are no bake!